The Clan Maitland Society of North America held it’s organizational meeting in Alexandria, VA on January 19,1980. John M. Maitland read a cable received that morning from the Right Honorable, The Earl of Lauderdale, Chief of the Clan Maitland, sending greetings to all those assembled and urged that the Clan motto, “Consilio et Animis”, (meaning with Wisdom and Courage) be the theme of their deliberations. Those deliberations that day resulted in the formation of a strong and viable organization to enrich our future years in carrying out its purposes of being historical, educational, literary, and musical as relating to the heritage and history of the Maitland/Lauderdale family and Scotland. As the name implies, our members are from both Canada and the United States. Annual meetings have been held since and are open to all members of the clan. The location for these meetings varies from place to place and are usually held in the fall of the year. Two trips of the North American group have been taken to Scotland. The first was in 1986 when 17 members took a group tour of Scotland where they visited many Maitlands and toured sites and buildings relating to the Maitland/Lauderdale family. The second, in 2009, 42 members traveled to the first ever “Homecoming Scotland” held in Edinburgh, with the first day being spent at the Highland Games and Gathering of the Clans held in Holyrood Park. Members visited Lennoxlove, Traquair House, St.Mary’s Collegiate Church with its Lauderdale Aisle, and had a delightful tea at Thirlestane Castle. In 2011 a Scholarship Fund was established and applications were made available to members of the clan in good standing. The one time award is $250.00 and applicants must have completed their freshman year of college/university in order to apply. Clan members, their children and grandchildren are eligible. The Maitland Matters newsletter is sent out four times a year via email attachment. Those few members who do not have email receive theirs by regular mail. Our membership year is from October 1st of the present year to September 30th of the following year. The Chief sends out his annual Yearbook usually near the holiday season. In 2012, and keeping up with the latest technology, a Closed Group Facebook Account was opened and this new web site for North America was established. The Society advertises in several Scottish publications and we keep in touch with Clan Societies in other parts of the world. 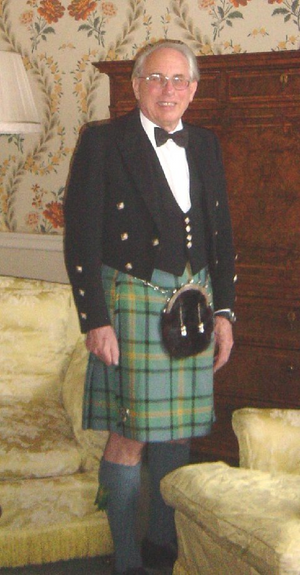 Ian Maitland is the present chief and the 18th Earl of Lauderdale. Born in Belgrade in 1937 he was brought up in New York during the Second World War, returning to the UK in 1945. He married Ann Paule Clark in 1963 and has two children, lady Sarah Maitland Parks and John, The Master of Lauderdale, Viscount Maitland, born in 1965. The chief worked in marketing, stock broking and finally banking, where he was the Senior Regional Manager for Africa and the Middle East for National Westminster Bank, now part of the Royal Bank of Scotland. In this role he traveled to all of the countries of the Middle East and many in Africa. Following retirement from the bank, he established a consultancy advising the London School of Economics on marketing, and conducted courses in Europe, Africa and Asia on evaluating bank and country risk. He is a member of the Queen's Bodyguard for Scotland, the Royal Company of Archers, and has been active in archery as well as performing ceremonial duties for the Sovereign. The chief's Coat of Arm contains two representations of the Sovereign’s National Flag of Scotland (Cross of St. Andrew) and Insignia of Office of the Honorable Office of Bearer for the Sovereign of the Sovereign's National Flag of Scotland. He is also a Freemason of the City of London. While at university he read history, which has formed the basis for much of the recent research on our family, and identified the link between the Maitland’s of Scotland and the Mautalent family of Normandy from which we are all descended. Whenever possible the chief travels to the countries where there are Clan Maitland Societies to meet other members of the family. Scott has a degree in Electronics Engineering and employed by American Roller Bearing as the Quality Manager in Hiddenite, NC. He has over 30 years of experience in Quality, with disciplines in industrial technology, aerospace, commercial avionics and micro-electronics. Scott also enjoys participating in the Highland Games and can be seen at about 20 to 25 games a year either as a competitor, judge or athletic director in the heavy athletics. He is the cousin of current VP Carolyn Dobbs. A member of several Scottish games and track throws coach at Lenoir-Rhyne University in Hickory, NC. Scott is married to his lovely wife Pam and they have 2 sons, 1 daughter and 3 grandchildren, residing in Catawba, NC. Carolyn has a Masters of Science in Taxation (MST) from Golden Gate University in San Francisco and a Bachelors Degree in Accounting from the University of New Mexico. She is the cousin of the current Clan Maitland Society of North America President, Scott Medlin. Carolyn resides in Rio Rancho, NM and works for Thornburg Investment Management Inc. in Santa Fe, NM. She has worked in the accounting industry for more than 30 years and is a CPA. Annette is a graduate of Maryville University in St. Louis, MO with a Bachelors Degree in Marketing & Minors in Business Management & International Marketing. Her father is the late George Maitland Lawrence, who served as a previous Vice President of the Clan Maitland Society of North America and who was cousins with current members Larry Holdridge and Margaret Alexander. Her mother, Ann MacCrone Lawrence and brother George Maitland Lawrence are also current members. Annette resides in Omaha, NE and has worked for Union Pacific Railroad for the last 33 years.